For over 20 years, the experienced attorneys at the Law Offices of Sef Krell have represented clients in a variety of legal matters. We believe in providing you with the time and attention that you and your case deserve, and whether you have been injured in an accident, are facing criminal charges, or have a workers’ compensation claim, our dedicated staff can help you. Through our hard work and dedication to our clients, we have obtained successful settlements from the Workers’ Compensation Appeals Board, including awards in excess of $100,000 in addition to 100% disability decisions. One of the most important rights you have as a criminal defendant is your right to be represented by legal counsel. With your freedom, reputation, and life in jeopardy, you need an experienced criminal defense lawyer fighting for you. To learn more about our vigorous criminal defense, contact our office to schedule your consultation. Our experienced Los Angeles personal injury lawyers have successfully represented countless clients to obtain the settlements they deserve. We offer potential clients a free initial consultation where we will sit down and discuss your case in detail with you. We will explain the legal process, and detail possible outcomes and results. Our attorneys are available weekends, evenings, and are happy to visit you in your home or in the hospital. Contact our office to schedule your consultation today. We also speak Spanish. Making a false or fraudulent Workers' Compensation claim is a felony subject to up to five years in prison, or a fine of up to $50,000, or double the value of the fraud, whichever is greater, or by both imprisonment and fine. Law Offices of Sef Krell is located in Encino, CA and serves clients in and around Woodland Hills, Wilmington, Harbor City, Carson, Torrance, San Pedro, Long Beach, Compton, Gardena, Paramount, Lynwood, Bellflower, South Gate, Los Angeles, Hawaiian Gardens, Artesia, Huntington Park, Cerritos, Bell, Norwalk, Maywood, Santa Fe Springs, Pico Rivera, Whittier and Los Angeles County. 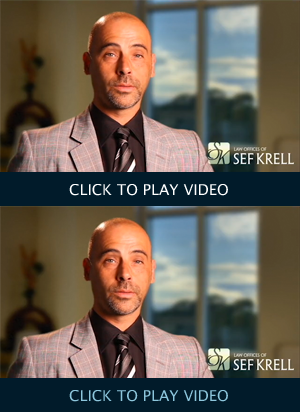 © 2013 - 2019 The Law Offices of Sef Krell. All rights reserved. Custom WebShop™ law firm website design.